Size: approx. 5 mm. Photo: 08/02/14, 8 pm. 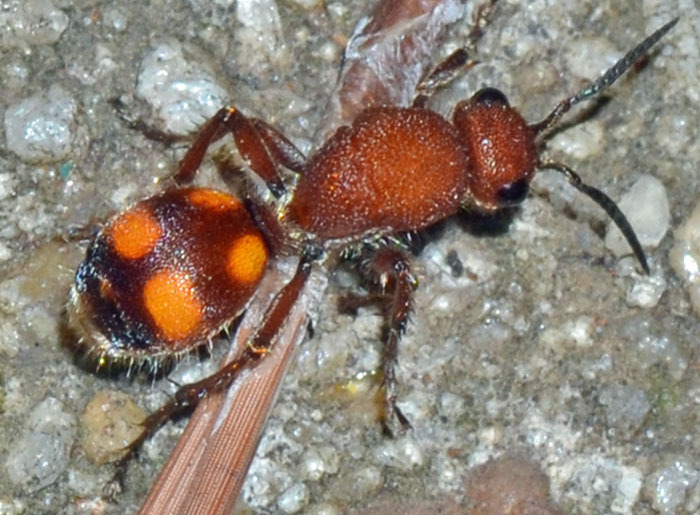 This is probably the first velvet ant that I have ever seen. It crossed our parking place at high speed and it was quite challenging to take this picture. Let me add that females can inflict a painful sting. They are also called "Cow Killers". Notice that this family belongs to the wasps, although especially the wingless females clearly resemble large ants. Velvet ants are solitary and typically hairy.